Approves the temporary road closures for the Masked Parade on 26 October 2018, Classic Car Display on 28 October 2018 and the Port Nelson Street Races on 2 January 2019. 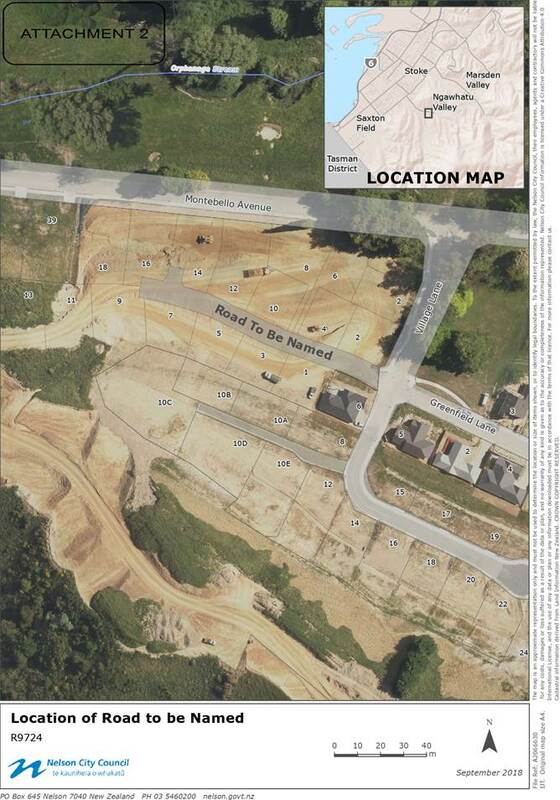 1.1 To approve or decline an application for the name of “Waterson Lane” for the road shown as Lot 96 in Stage 4 of the Montebello subdivision, on the Scheme Plan Montebello Subdivision (Attachment 1), and on the attached Location Map (Attachment 2). 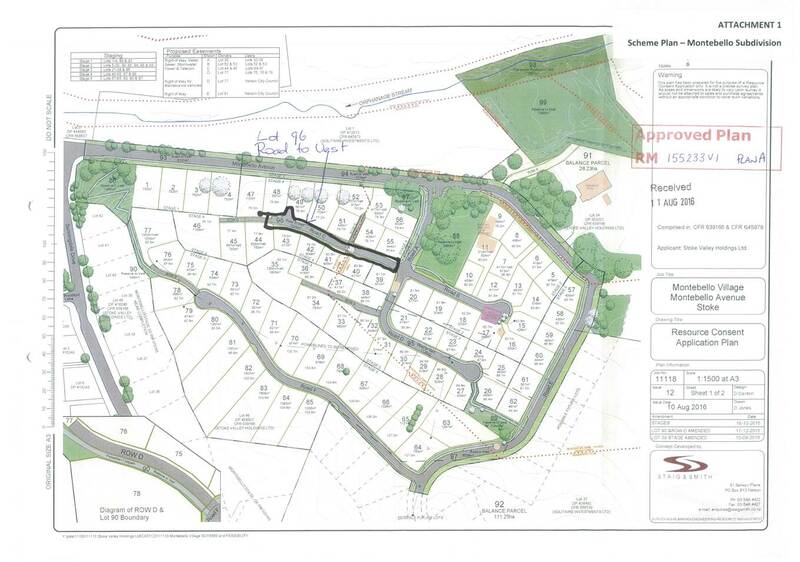 3.1 The applicant, Stoke Valley Holdings, has requested the name of “Waterson Lane” for the road shown as Lot 96 on the attached Land Transfer Plan. (Attachment 1). 3.2 The name “Waterson” has been proposed to reflect the contribution that John Waterson made when he worked in the area for over 40 years, as carpenter, maintaining the buildings, and groundsman for the former Ngawhatu Hospital. 3.3 Other names in the subdivision, “Greenfield Lane” and “Village Lane” were chosen because they reflected back on the history of the area. The applicant has proposed “Waterson” as it would have the same connection to the area. 3.4 The road is a cul-de-sac that runs off Village Lane; on the other side of Village Lane at this intersection, there is another cul-de-sac that has been named “Greenfield Lane”. The applicant initially wanted both cul-de-sacs to have the one name of Greenfield, but this does not comply with the NZ Standards for Rural and Urban Addressing (AS/NZS 4819:2003). 3.5 The Council has the authority to name roads, pursuant to Section 319(j) of the Local Government Act 1974. 3.6.1 The name should not be the same as or similar to any other street in the Nelson and Tasman Regions. 3.6.2 Where appropriate, due regard should be given to historical associations within the City. 3.6.3 Where possible, the name should be consistent with other names in the area, or consistent with a theme in the area/subdivision. 3.6.4 The name should not be likely to give offence. 3.6.5 The name should not be commercially based. 3.6.6 The length of the name should be appropriate to the length of the street (i.e. short names for short streets - for mapping purposes). 3.6.7 The name should not be likely to cause semantic difficulties, i.e. spelling, pronunciation, or general understanding. 3.6.8 As a general rule, the proposed name should not be that of a living person, except in exceptional circumstances. 4.1 The proposed name does conflict with 3.6.8 above, as Mr Waterson is still alive. The applicant has obtained the approval from Mr Waterson, to have the street named after him. 4.2 There are no similar road names in the Tasman District Council area that are likely to cause confusion with this name. 4.3 There are some street names in the Nelson City Council area that start with the word “Water”. These include “Waterdale Way” in the Brook area, and “Waterhouse Street” in the Enner Glynn area. As these names are sufficiently different in sound and spelling, it is unlikely that they would be confused with “Waterson”. 4.5.1 “Clover Lane” and “Cow Lane” which would have a connection with the former use of the land as farming. · There are some roads in the Tasman District Council area which start with “Clover”, i.e. “Clover Road East” and “Clover Road West”. The name “Clover Lane” might be likely to cause confusion. · There are no names in the Nelson or Tasman areas that are similar to “Cow Lane” and therefore no confusion should occur. 4.5.2 “Redfield” and “Blueberry”. Neither of these names has any particular connection with the area, and both have similar sounding names in either Nelson or Tasman. 5.1 The Council’s Hearings Panel has generally declined to approve any road names that are to be named after a living person (section 3.6.8 above). The most recent example of this was the request to name a street in the Daelyn subdivision after the developer. The Hearings Panel eventually approved the name of “Daelyn” which was a combination of part of the first names of the Developers. 5.2 This rule is a guideline only, and the Hearings Panel may decide if the circumstances in this case merit an exemption to the general guideline, and if this is likely to pose any risk to the Council. 6.1.4 To decline the proposed names and to ask the applicant to submit alternative names. Officers recommend approving the name “Waterson Lane”. “Cow Lane” is the developer’s second choice. The Council has the authority to name roads, pursuant to s 319(j) of the Local Government Act 1974. · Our Council provides leadership and fosters partnerships, a regional perspective pand community engagement. · The Council works with stakeholders to find appropriate names for roads to vest in Council. Checks are carried out to ensure that the proposed road names will not cause confusion to the public or to emergency services, if there are existing similar names. 1.1 To approve the temporary road closure application for the Masked Parade on 26 October 2018. 1.2 To approve the temporary road closure application for the Classic Car Display on 28 October 2018. 1.3 To approve the temporary road closure application for the Port Nelson Street Races on 2 January 2019. 4.1 On 25 July 2018, an application was received for the temporary road closures of the roads listed below for the Masked Parade to be held on Friday 26 October 2018. 4.2 This is application is for the same road closures that were implemented for the Mask Parade in 2017. 4.3 The reasons for the extent and duration of the proposed road closure is to enable the Nelson City Council to hold the annual Masked Parade and to install and dismantle all associated traffic management equipment. 4.4 Nelmac will be implementing the traffic management for this event. 4.5 Council Officers placed an advertisement in Our Nelson on Tuesday 7 August 2018 informing of the proposed closure and asking for written feedback by Thursday 23 August 2018. No feedback was received. 4.6 The applicant has been granted a noise consent for this event (RC155195V1). 4.7 This event will be covered by Nelson City Council’s insurance. 4.8 Consultation with Police has been undertaken and they have raised no issues regarding this event. 4.9 Consultation with NZTA has not been undertaken for this event due to this not having any impact on the State Highway. 4.10 Emergency access to all areas of the closed roads will be provided at all times. 4.11 The road closures will not exceed the aggregate of 31 days for any year. 4.12 Council officers are satisfied that the road closures will not unreasonably impede traffic because alternate routes are available and the extent and duration is limited. 4.13 Council officers recommend that this application be approved. 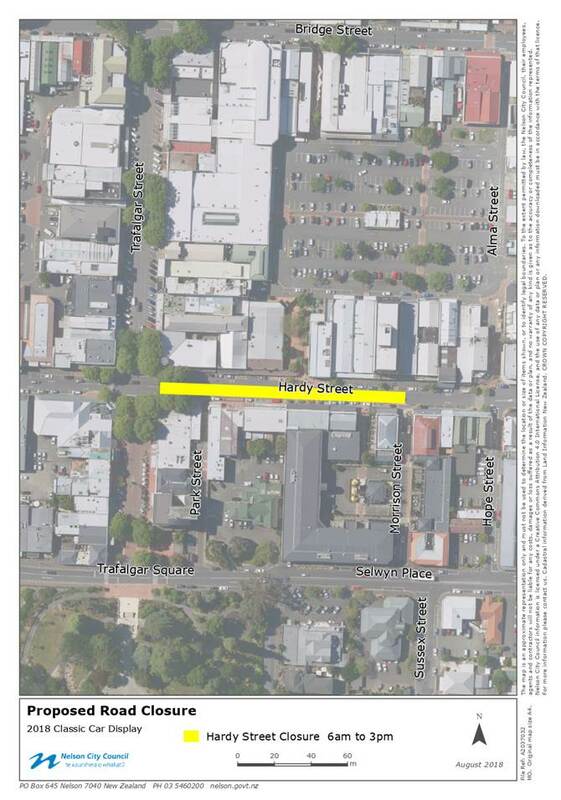 4.14 On 17 August 2018, an application was received for the temporary road closure of Hardy Street from Trafalgar Street to Morrison Street for a Classic Car display and fundraising for Nelson Hospice. The road closure is proposed to be held on Sunday 28 October 2018 between 6am and 3pm. 4.15 The reasons for the extent and duration of the proposed road closure is to reduce the risk of having members of the public parking cars in the closure area before the organisers set up for the event. This also allows for installation and removal of associated traffic management equipment. 4.16 Asphalt and General Ltd will be implementing the traffic management for this event. 4.17 Council Officers placed an advertisement in Our Nelson on Tuesday 4 September 2018 informing of the proposed closure and asking for written feedback by Thursday 21 September 2018. Any feedback received after completion of writing this report will be distributed at the meeting. 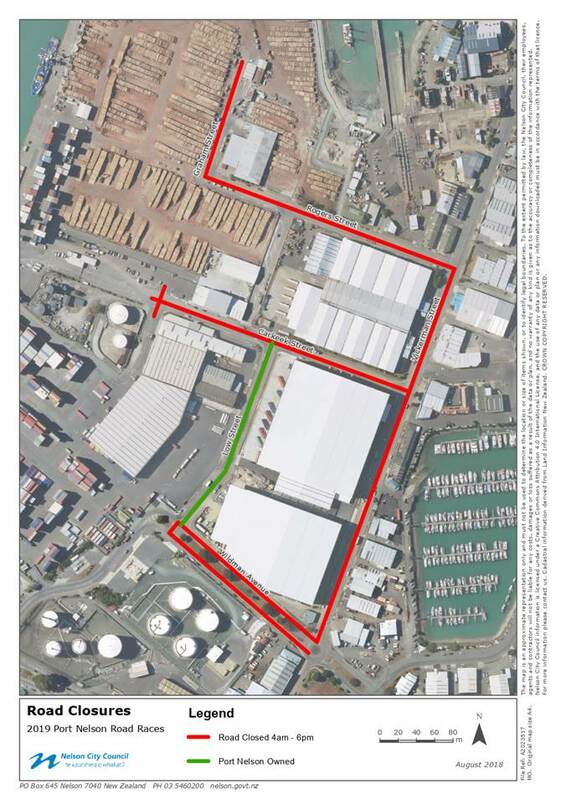 4.18 A request was received from Mr Simon Duffy at Uniquely Nelson on the 11 September requesting the closure area be increased. The new proposed area of Hardy Street being from Trafalgar Street to Collingwood Street. Mr Duffy has consulted with the extra businesses this addition would directly affect and has received no negative feedback. This closure would also result in Morrison Street and Hope Street being closed to through traffic. 4.19 Due to this late request to modify the closure Council officers placed an advertisement in the Nelson Mail on Saturday 15 September detailing the road closure including the areas requested by Uniquely Nelson and requesting feedback by Thursday 21 September 2018. Any feedback received after completion of writing this report will be distributed at the meeting. 4.20 A noise consent is not required for this event. 4.21 The applicant has shown evidence of adequate public liability insurance. 4.22 Consultation with Police has been undertaken for this event and they have raised no issues regarding this event. 4.23 Consultation with NZTA has not been undertaken for this event due to this not having any impact on the State Highway. 4.24 Emergency access to all areas of the closed roads will be provided at all times. 4.25 The road closures will not exceed the aggregate of 31 days for any year. 4.26 Council officers are satisfied that the road closures will not unreasonably impede traffic because alternate routes are available and the extent and duration is limited. 4.27 Council officers recommend that this application be approved. 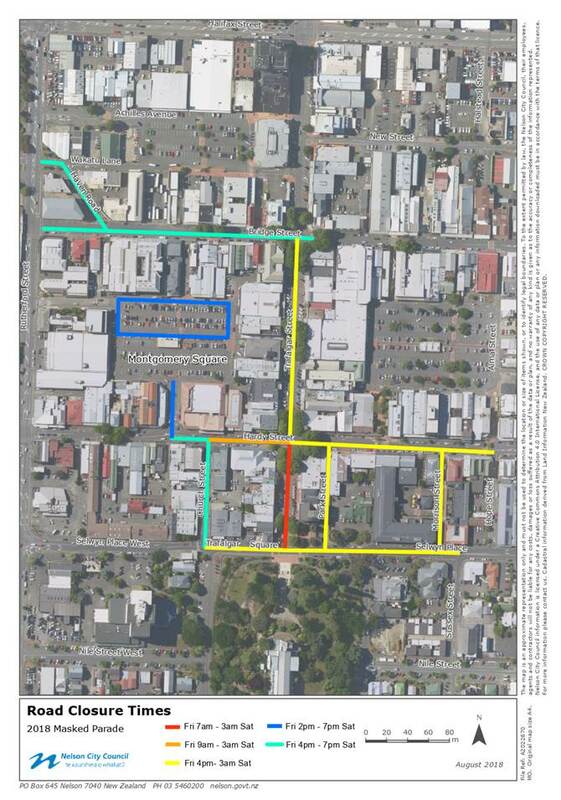 4.28 On 26 June 2018, an application was received for the temporary road closures of Vickerman Street, Wildman Ave, Carkeek Street, Graham Street and Rodgers Street for the Port Nelson Street Races to be held on Tuesday 2 January 2019 between 4am and 6pm. 4.29 This is application is for the same road closures that were implemented for the Port Street races this year. 4.30 The reasons for the extent and duration of the proposed road closure is to enable the Nelson Road Race Association to hold their annual street race and to install and dismantle the race track and all associated traffic management equipment. These street races are a long-running Nelson fixture held annually. 4.31 Safe Traffic NZ Ltd will be implementing the traffic management for this event. 4.32 Council officers placed an advertisement in Our Nelson on Tuesday 7 August 2018 informing of the proposed closure and asking for written feedback by Thursday 23 August 2018. No feedback was received. 4.33 The applicant has been granted a noise consent for this event (RM145143). 4.34 Historically the applicant’s public liability insurance certificate is received in December when they renew their insurance. It is expected that the same will happen this year. 4.35 Consultation with Police has been undertaken for this event and they have raised no issues regarding this event. 4.36 NZTA approval will be sought for signage on the State Highway as part of the Traffic Management Plan process for this event. 4.37 Emergency access to all areas of the closed roads will be provided at all times. 4.38 The road closures will not exceed the aggregate of 31 days for any year. 4.39 Council officers are satisfied that the road closures will not unreasonably impede traffic because the extent and duration is limited, traffic along this route is minimal, consultation has been undertaken with Port Nelson Ltd and this event is being held on a public holiday when most businesses in this area are closed. 4.40 Council officers recommend that this application be approved. 5.1 The Hearings Panel has two options, either to approve or decline the temporary road closure applications. Officers recommend approving the temporary road closures. There is no financial impact to Council for these road closures. This matter is of medium significance because of the number of people affected and the short duration of the events. A request for feedback was advertised in Our Nelson and on the Council’s website. · The power to consider and determine applications for temporary road closures made under Schedule 10 Clause 11(e) of the Local Government Act 1974. 1.1 To approve proposed alterations to Schedules of the Parking and Vehicle Control Bylaw (2011), No 207, to give effect to minor safety and parking improvements, roading improvements carried out as part of the capital works programme and changes from new subdivisions. 3.1 The Parking and Vehicle Control Bylaw 2011 allows for the Council by resolution, to add, amend or delete specifications contained within the Schedules. The Council has delegated this power to the Hearings Panel -Other. To ensure that the Bylaw is enforceable it is important to ensure that the Schedules are updated on a regular basis. The Bylaw Schedules were last updated in July 2018. 3.2 Minor alterations and additions are proposed to Schedules 4 and 9 of the Bylaw as detailed in section 4. 3.3 The proposed alterations and additions are shown for indicative purposes only by plans attached to this report. The purpose of these plans is to assist the panel to easily and quickly understand the nature of the changes proposed. These plans will not form part of the final bylaw. The actual changes as they will be incorporated into the final Bylaw, and with the level of detail required for enforcement purposes, will be set out in the amended Schedules. 4.1.1 Following the request from a resident of Piko Street, the need for no stopping has been identified at the turning head of Piko Street as shown in Attachment 1, titled 4.1. These changes are proposed to improve the turning ability for residential traffic, rubbish collection trucks and emergency service vehicles that would otherwise have difficulty turning due to parked vehicles. Feedback has been in support of this change following a request for feedback from all residents of Piko Street, (two for, nil against). This change is in line with Council design standards for line marking of cul-de-sacs. Officers support this change. 4.2.1 As a result of development proposed at 24 Examiner Street, one on-street carpark is to be removed to allow the existing vehicle entrance to be widened. This change has resulted from a resource consent application. One on-street carpark will be replaced by one off-street carpark (within the boundaries of 24 Examiner Street). 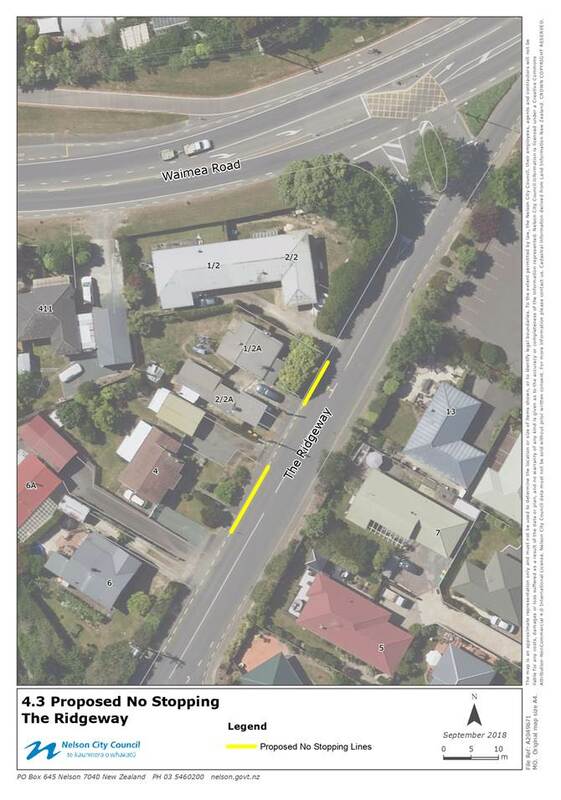 No stopping is proposed to replace the one on-street carpark being removed as shown in Attachment 1, titled 4.2. Officers support this change. 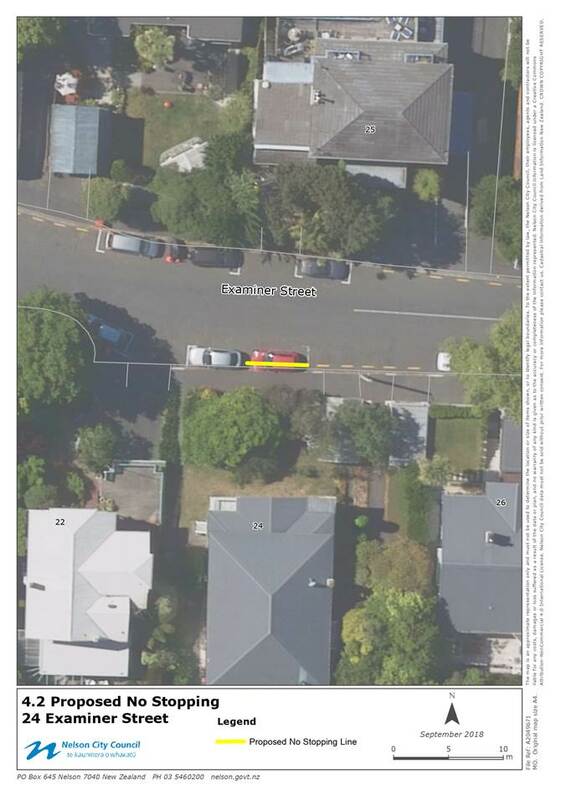 4.3.1 Following concerns raised over vehicles parking along the western side of The Ridgeway (between Chings Road and Waimea Road), officers propose the installation of no stopping to remove some of the parking along the western side of The Ridgeway as shown in Attachment 1, titled 4.3. This proposal would create one continuous no stopping line between Chings Road and Waimea Road to reduce the likelihood of northbound vehicles crossing the centreline into the path of south bound vehicles. Vehicles exiting Waimea Road are generally travelling at speeds greater than 50km/h (deceleration from 70km/h to 50km/h) which compounds the issue. Feedback from adjoining residents has been supportive of this change (one for, nil against). Officers also support this change. 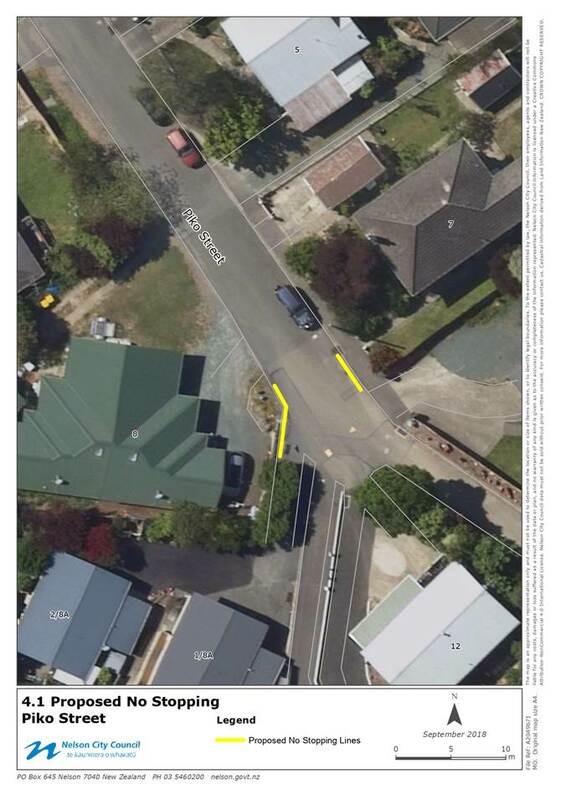 4.4.1 As a result of development underway at 48 Tahunanui Drive, sight lines from this property require the installation of no stopping directly south of the altered vehicle crossing as shown in Attachment 1, titled 4.4. The net effect of this change is the loss of one on-street carpark. NZTA has given approval for this change on its network. Officers support this change. 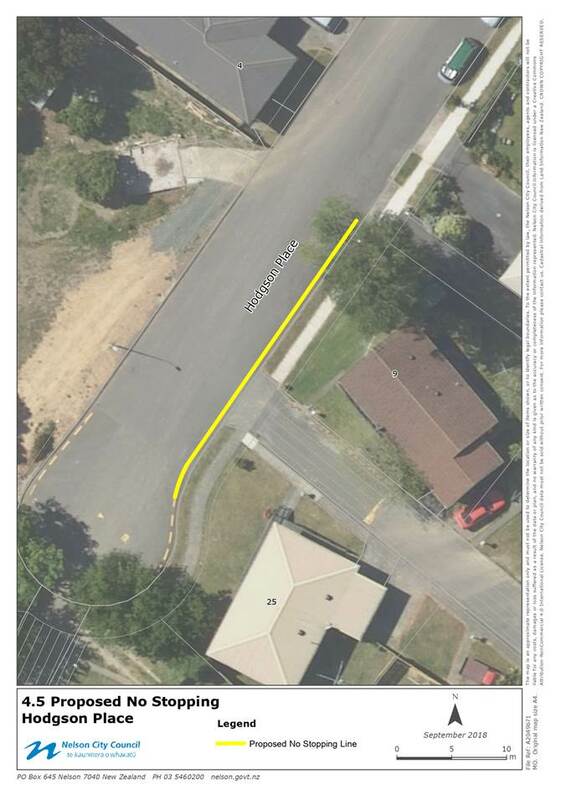 4.5.1 As a result of parking changes on Hodgson Place in relation to the new kindergarten, no stopping is required opposite the proposed perpendicular parking to ensure the safe and efficient use of the transport corridor as shown in Attachment 1, titled 4.5. Feedback was received from one adjacent tenant during the consultation period, who raised concerns around turning movements with a high number of children in the street. The majority of the concerns were addressed at resource consent stage, and officers recommend proceeding with this no stopping. 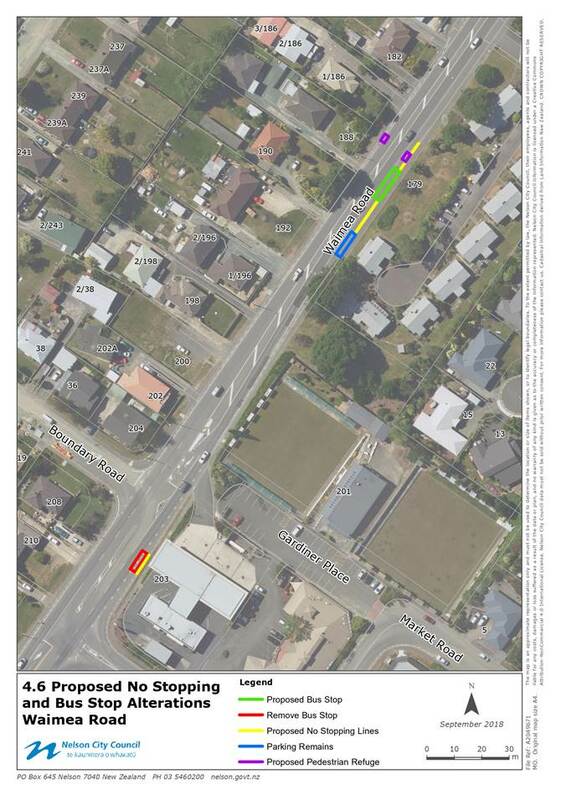 4.6.1 As a result of the proposed pedestrian refuge and bus stop alterations planned for Waimea Road, no stopping is required for safe and efficient access to the bus stop as shown in Attachment 1, titled 4.6. At the time of writing this report, feedback is still being sought on the proposed changes. Any feedback received will be discussed verbally (if required) at the meeting. Officers support this proposal. 4.7.1 Following resolution from the Works and Infrastructure committee on the 28 June 2018, option 3C of Report 9361 was approved. 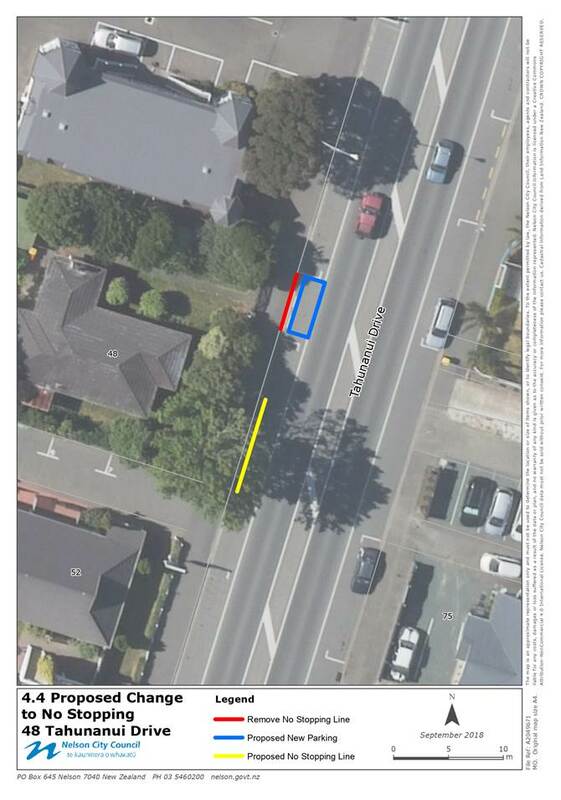 4.7.2 Option 3C identified the relocation of the current bus stop near Caltex Bishopdale, to align with the proposed pedestrian refuge on Waimea Road near the Russell Street flats. 4.7.3 The existing southbound bus stop adjacent to Caltex Bishopdale was temporarily relocated to Russell Flats during the York Stream stormwater upgrade works in 2016. This temporary location received very positive public feedback and is approved to be the permanent location. The relocated bus stop can be seen on Attachment 1, titled 4.6. 5.1 There are limited alternative options for the items presented in this report as the majority in schedule 4 and 9 are proposed changes to improve safe and efficient traffic movement. Option 1 is the preferred option. Option 2: Do not adopt changes as attached for Schedules 4 and 9. · Failure to approve changes will delay or prevent development under the Resource Management Act (RMA). The content and recommendation of this report is consistent with Councils Community Outcomes – “Our Infrastructure is efficient, cost effective and meets current and future needs”. In particular that we have good quality, affordable and effective infrastructure and transport networks. This report is directly aligned to the requirements of the Parking Policy, the Parking and Vehicle Control Bylaw and with Council’s strategic direction through the Regional Land Transport Strategy. To ensure that the Bylaw is enforceable, it is important to ensure that the Schedules are updated on a regular basis. Failure to update Schedules will open enforcement up to challenge. Costs are within allocated annual budgets for road maintenance or capital projects, or where required, will be covered by private individuals during development. This matter is of low significance. Nearby businesses and residents that could be affected, have been consulted. The Hearings Panel - Other has the following delegations to consider changes to the Parking and vehicle Control Bylaw.